← Killing 11 Month Old Babies is not Self Defence! 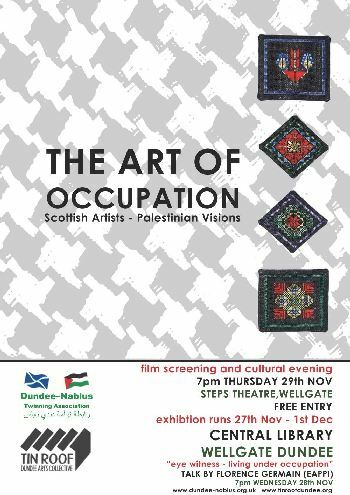 Scottish artists present work on a Palestinian theme to celebrate over 30 years of twinning between Dundee and Nablus (in Palestine). The exhibition features a variety of artists in different media and with explanations of the twinning. Florence recently spent 3 months in a small village near Nablus. She was there as a witness and to support the villagers whose land has been taken by Israeli settlers. Her talk will describe how this has affected the lives of the people in the village. An enjoyable and informative evening for all. The first cut of the new film about Dundee and Nablus will present a picture of the people of both cities and explore some of the similarities and differences. The film-makers and the group who visited Nablus last month will be on hand to answer any questions you have about the film, about Nablus or about the twinning. This entry was posted in Dundee, Events, Meeting, Nablus, Occupation, Uncategorized and tagged Dundee, Nablus, Occupation. Bookmark the permalink.